Noida-based iRead Books Pvt Ltd, which runs an online book rental platform IndiaReads.com, is in advance discussions to raise $2.5 million (Rs 16 crore) in Series A funding from a bunch of venture capital investors, a top company official told Techcircle.in. The company will primarily use the funds to strengthen its web interface, improve the platform's security and general brand building purposes. "Currently, we are talking to three VC firms to raise the money. These are regular VC investors who invest in the consumer Internet space and have couple of offices in the country," Pranil Bafna, CEO of the company, said. IndiaReads.com generates monthly revenue of about Rs 30 lakh through rentals. The company, which has its own inventory of books, charges rentals for a physical book to its price and the duration for which it is kept. "If you need a book for three months, the rent could be around 30-35 per cent of the actual book price and if you are taking for a month, it can be 20-25 per cent (of the book price)," Bafna added. Further, he said: "Revenue is a very tricky thing to calculate, primarily because when a book goes out, we really don't know when will it come back to us, what is the exact amount that we would get as rent and what will be the exact amount we will be refunding to the user. So, there is always going to be a question mark for us." The company, which competes with the likes of Librarywala.com, Justbookclc.com and others, had raised around Rs 1.25 crore in angel funding from two IIT alumni last year. Bafna himself is an IIT Bombay alumni while fellow colleague Shreyans Mehta graduated from Manipal Institute of Technology. Indiareads.com was founded by Gunjan Veda in 2009 when she realised the need to provide access to an affordable reading platform across India in her interactions with the youth. In 2013, Veda stepped back and brought on board Bafna as CEO and Shreyans Mehta as Chief Marketing Officer. This was the same year when chegg.com, the US-based textbook rental platform, got listed. 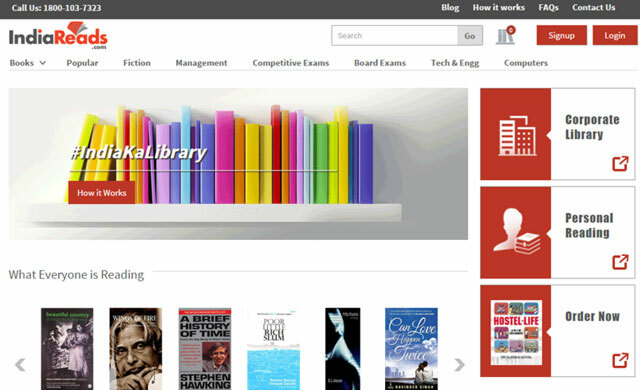 IndiaReads.com plan to launch its e-book section in the next six months. It currently renders services in over 500 cities. The company claims to have about one lakh corporate users and around 60,000 student subscribers, many of whom are preparing for competitive exams. Going forward, IndiaReads.com aims to build an affordable reading house. In March 2015 alone, the company had over 10,000 rental shipments, said Bafna. Its 22 staffers currently service corporate clients such as HDFC Bank, Axis Bank, Genpact and Mahindra & Mahindra among others. US-based Magzter Inc., which owns and operates the digital magazine store Magzter.com, had recently launched a new subscription model that gives users access to thousands of magazines for a period-linked fee. IndiaReads.com iRead Books Pvt. Ltd.